I’m sure you’ve been in a store and had the idea of a lifetime. You frantically search around you for a slip of paper to jot it down, but you can’t find anything. You turn to your iPhone, but you just can’t bring yourself to use the included Notes app because of its lack of customizability and syncing. Sighing heavily, you resign yet another world-changing idea to the possibility of remaining trapped within the echoing corridors of your mind. WriteRoom for the iPhone and iPod touch can save that idea (and perhaps, by extension, the world). You might be familiar with the mobile app’s big sibling, the Mac text editor by Hog Bay Software which shares the same name. WriteRoom for the Mac ( is famous for having a fullscreen interface which minimizes distractions and helps you focus on writing. Unlike with Mac programs, though, every iPhone app is presented in ‘fullscreen mode,’ so WriteRoom for the iPhone can’t rest on its big brother’s big feature to stand out in the crowded iPhone text-editing field. The Numbers Game: Among WriteRoom’s many features is a Document Statistics capability that lists how many paragraphs, words, and characters your document has. When you launch WriteRoom, you’re presented with a list of all the documents you’ve written. To start a new document, just tap the plus sign in the upper right corner and start writing. When you’re planning on writing a longer document, tilt your iPhone into landscape mode to use a larger keyboard. Text entry is fast, and the application remains responsive with a very large amount of text in one document. (I pasted a 40,000-word treatise into a WriteRoom document and it still scrolled smoothly). Does WriteRoom address the commonly lamented facets of Notes—namely, no control over fonts and no way of syncing documents with your Mac? Yes, it does. WriteRoom allows you to create documents using any of the iPhone’s built-in fonts (including Marker Felt, which is what the Notes app uses) and with fonts of any number of sizes. You can also go a few steps further and customize the background, font, and scroller color in case you don’t dig the default color scheme of white type on a black background. Syncing is addressed in a clever way, that, technically, isn’t syncing at all but rather sharing. Tapping on the Share icon in the upper left hand corner of the document list view starts sharing your documents over Wi-Fi using a built in Web server (over port 52332 by default but you can change the port number if you like). Enter the address displayed by a popup into a browser on the same network, and you’ll see the WriteRoom interface displayed. You can add, edit, or delete notes as you would on the iPhone itself. This makes it a breeze to transfer documents to and from WriteRoom. It would be nice if WriteRoom for the iPhone would sync, automatically, with a copy of WriteRoom running on a Mac—perhaps that’s something for a future version. WriteRoom also has a few other features that reveal themselves when you click the actions icon at the center button of the currently open note. You can delete the document; e-mail it (set a default recipient in the WriteRoom preferences and save yourself the trouble of addressing each e-mail); and rename the document (which changes the name of the document in the list view). Last, but far from least, is the Document Statistics button which shows a popup alert listing how many paragraphs, words, and characters your document has—very handy for those statically inclined writers out there. If you find yourself using your iPhone as a replacement for your ideas notebook and don’t care for the device’s included Notes app, WriteRoom is well worth its $5 price tag for the ease of copying documents to and from your iPhone (and doubly so if you plan on buying another of Hog Bay Software’s apps, because you get a coupon with WriteRoom for the iPhone that is good for $5 off the price of either WriteRoom for the Mac or Taskpaper). 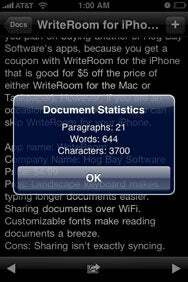 WriteRoom is compatible with any iPhone or iPod touch running the iPhone 2.x software update.